Featuring a custom built Arduino shield, three buttons, and a display, it might look like any other compact, pocket-sized camera. However, this device has a purpose: cultural probe. It’s a ‘taskcam’, a camera created with the specific task of taking photos for a cultural probe. Designed as a means of gathering data about people’s lives (or their values, or even thoughts), a cultural probe lets participants record events and interactions, or even feelings. The end result should enable the instigator of the project to understand the subject’s culture and values. In this build, the compact 124mm x 50mm x 107mm LCD displays a series of custom-created questions to inspire the user. Buttons either side of the display cycle through these questions, while the one above is a dual power/shutter button. Photos are created in 1024 x 768 pixel resolution and stored to microSD card. Meanwhile, the questions are stored in a text file called q.txt. You can either create this yourself (one question per line) or use the interface on the project website to compile the questions and download q.txt. At the heart of this project is the custom shield, which can be ordered from the developer, or built at your own convenience. It comes in three parts: a camera module, a battery module, and the display board. Cables connect these to the Arduino Uno and to each other. 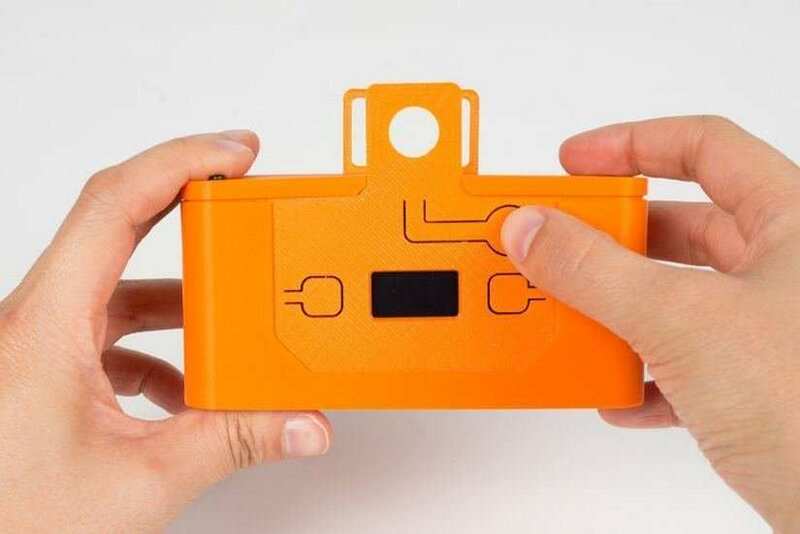 It’s all held together with a stylish-but-basic 3D printed camera case and powered with a pair of AA batteries. The design is pretty good, and uses the line-of-sight style viewfinder; all you need to do is point and shoot! Whether you’re planning to carry out a cultural probe or simply want a compact, and somewhat funky Arduino-powered camera project, this is worth checking out. Head to the project website to find out more and grab the template for the 3D printed case.